Context. What kind of work setting do you like and what do you hate? Formal? Outdoors? Individual or group? US or international? Full time or part-time? Salary or commission? Compensation. How much money do you want to make and how much do you need to make to maintain desired life-style? 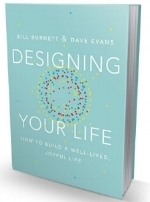 Burnett and Evans also describe one of the fundamental characteristics of the designer’s mind-set and that is the bias to action and the constant prototyping of ideas. While planning and considering the options are essential, at some juncture, you have to move forward and experiment with your ideas. Try something, assess the impact, rework the idea. Build your future forward. The “Six Cs of the What’s Next?” are a good foundation, but then get on with it and build a better life. Older PostWhat do you do? Ugh!! !